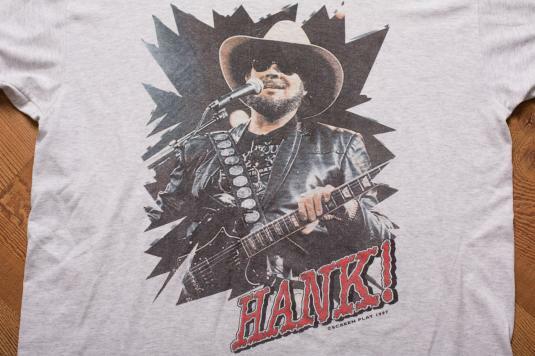 Vintage 1990s Hank Williams Jr. graphic t-shirt from his 1997 Southern Thunder concert tour. It is in okay vintage used condition with wear, staining on collar, faint staining in pits, light staining on shoulder tops and upper back/neck, and several little paint dot stains. ***Don't go by the tag size! *** – Use measurements to ensure proper fit. Actual Size: Modern XL? – Length 29″ – Pit to pit 23"